Scientists at EPFL’s Institute of Chemical Sciences and Engineering have created a photocatalytic system based on a material in the class of metal-organic frameworks (MOFs). The system can be used to degrade pollutants that are found in water while at the same time yielding hydrogen that can be trapped and used further. Some of the most beneficial and multipurpose materials these days are the MOFs. MOFs are a group of materials exhibiting structural versatility, fascinating optical, high porosity, and electronic properties, all of which makes them potential candidates for a range of applications, including sensors, gas capture and separation, and photocatalysis. As MOFs are very versatile in both their structural design and practicality, material scientists are now testing them in several chemical applications. One of these is a process called photocatalysis, where a light-sensitive material is excited with light. The absorbed surplus energy dislocates electrons from their atomic orbits, leaving behind “electron holes”. The creation of such electron-hole pairs is a vital process in any light-dependent energy process, and, in this case, it allows the MOF to influence a range of chemical reactions. Is On-Site Electrolysis Hydrogen Generation a Fit for Your Hydrogen Requirement? 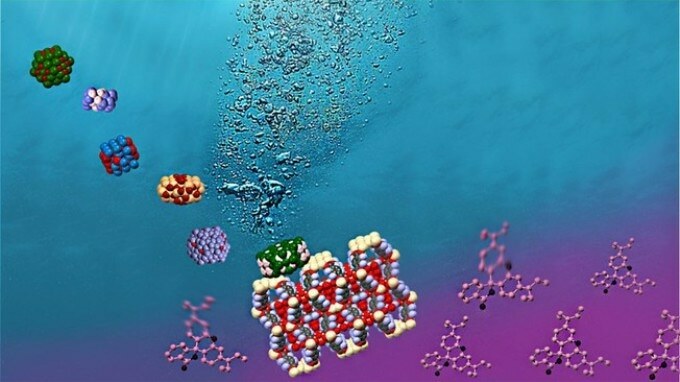 A team of researchers at EPFL Sion led by Kyriakos Stylianou at the Laboratory of Molecular Simulation, have recently designed a MOF-based system that can perform not one, but two types of photocatalysis at the same time: creation of hydrogen, and cleaning pollutants out of water. The material contains the copiously available and inexpensive nickel phosphide (Ni2P), and was observed to carry out efficient photocatalysis under visible light, which makes up 44% of the solar spectrum. The first type of photocatalysis, hydrogen production, includes a reaction known as “water-splitting”. Like the name indicates, the reaction splits water molecules into their constituents: oxygen and hydrogen. One of the bigger applications here is to utilize the hydrogen for fuel cells, which are energy-supply devices used in a range of technologies today, including space shuttles and satellites. The second type of photocatalysis is called “organic pollutant degradation”, which refers to processes breaking down pollutants found in water. The scientists considered this advanced MOF-based photocatalytic system for the degradation of the poisonous dye rhodamine B, regularly used to mimic organic pollutants. The researchers did both tests in sequence, demonstrating that the MOF-based photocatalytic system is capable of integrating the photocatalytic generation of hydrogen with the degradation of rhodamine B in a solo process. This means that it is at present possible to use this photocatalytic system to clean pollutants out of water, as well as concurrently create hydrogen that can be used as a fuel. This noble-metal free photocatalytic system brings the field of photocatalysis a step closer to practical ‘solar-driven’ applications and showcases the great potential of MOFs in this field. Kyriakos Stylianou, scientist, EPFL Sion. The research was funded by Swiss National Science Foundation and NCCR-MARVEL.